As can be seen from the image, the editor displays the line numbers in an area to the left of the area for editing. The editor will highlight the line containing the cursor. 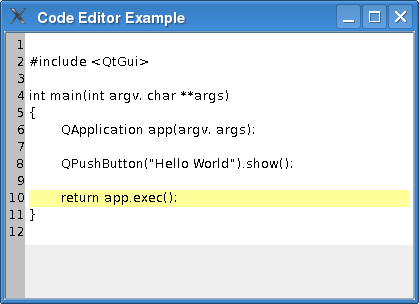 We implement the editor in CodeEditor, which is a widget that inherits QPlainTextEdit. We keep a separate widget in CodeEditor (LineNumberArea) onto which we draw the line numbers. QPlainTextEdit inherits from QAbstractScrollArea, and editing takes place within its viewport()'s margins. We make room for our line number area by setting the left margin of the viewport to the size we need to draw the line numbers. When it comes to editing code, we prefer QPlainTextEdit over QTextEdit because it is optimized for handling plain text. See the QPlainTextEdit class description for details. QPlainTextEdit lets us add selections in addition to the selection the user can make with the mouse or keyboard. We use this functionality to highlight the current line. More on this later. We will now move on to the definitions and implementations of CodeEditor and LineNumberArea. Let's start with the LineNumberArea class. We paint the line numbers on this widget, and place it over the CodeEditor's viewport()'s left margin area. We need to use protected functions in QPlainTextEdit while painting the area. So to keep things simple, we paint the area in the CodeEditor class. The area also asks the editor to calculate its size hint. Note that we could simply paint the line numbers directly on the code editor, and drop the LineNumberArea class. However, the QWidget class helps us to scroll() its contents. Also, having a separate widget is the right choice if we wish to extend the editor with breakpoints or other code editor features. The widget would then help in the handling of mouse events. In the editor we resize and draw the line numbers on the LineNumberArea. We need to do this when the number of lines in the editor changes, and when the editor's viewport() is scrolled. Of course, it is also done when the editor's size changes. We do this in updateLineNumberWidth() and updateLineNumberArea(). Whenever, the cursor's position changes, we highlight the current line in highlightCurrentLine(). We will now go through the code editors implementation, starting off with the constructor. In the constructor we connect our slots to signals in QPlainTextEdit. It is necessary to calculate the line number area width and highlight the first line when the editor is created. The lineNumberAreaWidth() function calculates the width of the LineNumberArea widget. We take the number of digits in the last line of the editor and multiply that with the maximum width of a digit. When we update the width of the line number area, we simply call QAbstractScrollArea::setViewportMargins(). This slot is invoked when the editors viewport has been scrolled. The QRect given as argument is the part of the editing area that is do be updated (redrawn). dy holds the number of pixels the view has been scrolled vertically. When the size of the editor changes, we also need to resize the line number area. When the cursor position changes, we highlight the current line, i.e., the line containing the cursor. QPlainTextEdit gives the possibility to have more than one selection at the same time. we can set the character format (QTextCharFormat) of these selections. We clear the cursors selection before setting the new new QPlainTextEdit::ExtraSelection, else several lines would get highlighted when the user selects multiple lines with the mouse. One sets the selection with a text cursor. When using the FullWidthSelection property, the current cursor text block (line) will be selected. If you want to select just a portion of the text block, the cursor should be moved with QTextCursor::movePosition() from a position set with setPosition(). The lineNumberAreaPaintEvent() is called from LineNumberArea whenever it receives a paint event. We start off by painting the widget's background. We will now loop through all visible lines and paint the line numbers in the extra area for each line. Notice that in a plain text edit each line will consist of one QTextBlock; though, if line wrapping is enabled, a line may span several rows in the text edit's viewport. We get the top and bottom y-coordinate of the first text block, and adjust these values by the height of the current text block in each iteration in the loop. Notice that we check if the block is visible in addition to check if it is in the areas viewport - a block can, for example, be hidden by a window placed over the text edit. No self-respecting code editor is without a syntax highligther; the Syntax Highlighter Example shows how to create one. In addition to line numbers, you can add more to the extra area, for instance, break points. QSyntaxHighlighter gives the possibility to add user data to each text block with setCurrentBlockUserData(). This can be used to implement parenthesis matching. In the highlightCurrentLine(), the data of the currentBlock() can be fetched with QTextBlock::userData(). Matching parentheses can be highlighted with an extra selection. The "Matching Parentheses with QSyntaxHighlighter" article in Qt Quarterly 31 implements this. You find it here: http://doc.qt.io/archives/qq/.